The classic white shirt is a wardrobe staple that every man should own. Timeless and versatile, it’s the ultimate go-to piece of clothing for any season or occasion. Going to a business meeting? Wear a white Oxford shirt with a navy or grey suit. Date night? Match your white button up shirt with a neat pair of jeans and a pair of boots or loafers. Aiming for a grunge look? Wear a black biker jacket over your white shirt. Regardless of how you choose to wear it, the classic white shirt will never go out of style. There are many ways to wear a white shirt. If you already have one or two white shirts in your closet, then you’re already on your way to perfecting this all-season look. Here are 4 ways to wear your white shirt, to help you make the most of this diverse and classic item on your wardrobe. Are you attending a formal event? The classic white Oxford shirt goes perfectly with a black suit. Alternatively, you can keep things easy by pairing a white Oxford shirt with a black or grey tie and black suit trousers. If you’re a business man, you can wear a white Oxford shirt with a navy or grey suit to keep you looking professional in business meetings. For a more casual business look, you may remove the suit jacket, roll up the sleeves and take off the tie. Keep your formal or business look simple and wear minimal accessories. For this look, cuff links will suffice. 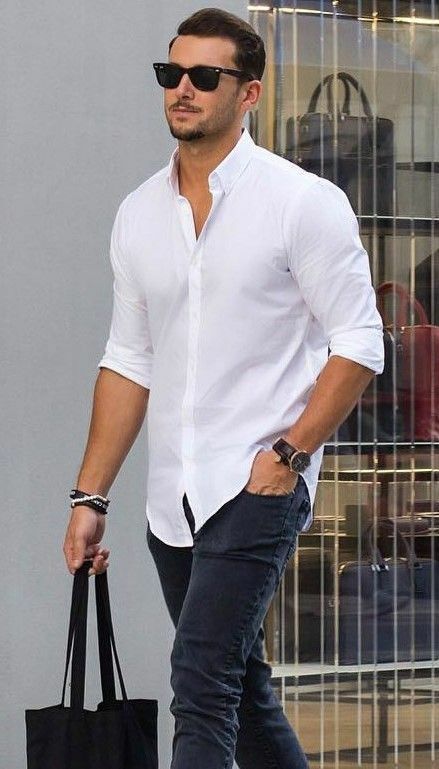 For a stylish and comfortable casual look, wear your white shirt with a well-fitting pair of jeans, a brown leather belt and pair of casual loafers or moccasins. Keep the sleeves of your shirt rolled up. For a look with a ‘bad boy’ vibe, add a black leather jacket and a pair of aviator sunglasses. You’ll surely draw admiring glances from admirers. Are you aiming for a smart casual look? Often times, it’s hard to find the middle ground between formal, black tie attire and casual wear. The white shirt allows you to effortlessly find this balance. For a smart casual look, wear your white shirt with a pair of smart trousers. If you’re feeling bold, go for patterned trousers. The white shirt will tone down the look. Complete the ensemble with a pair of loafers, boat shoes, or white trainers. For a laid-back, preppy look that’s perfect for summer, wear your white shirt with a pair of tailored dark navy shorts, brown belt and matching boat shoes. Keep the sleeves of the shirt rolled up. Complete the look with a pair of sunglasses and you’ll be seaside holiday ready. The men’s white shirt is truly diverse, and is a great investment for your wardrobe. Pair it with jeans for a more downplayed look, or with trousers for a more formal look. You can pair it with loafers or brogues to heighten a formal ensemble or with trainers to add to a casual outfit. There are truly countless ways you can wear a white shirt! One final word of advice: make sure your white shirt fits you perfectly. There’s nothing worse than an ill-fitting shirt!